They're beautiful and effective — and they cost mere pennies! Hello, friends! I’m here today to tell you about one of my tiny secret weapons in the war against being a disorganized mess: book darts. There are a handful of pages I reference a lot in my journal — a monthly habit tracker, a weekly task list, a daily to-do list — and while having an index and page numbers makes finding everything much easier, sometimes a gal just wants to be able to flip quickly to the page she needs. 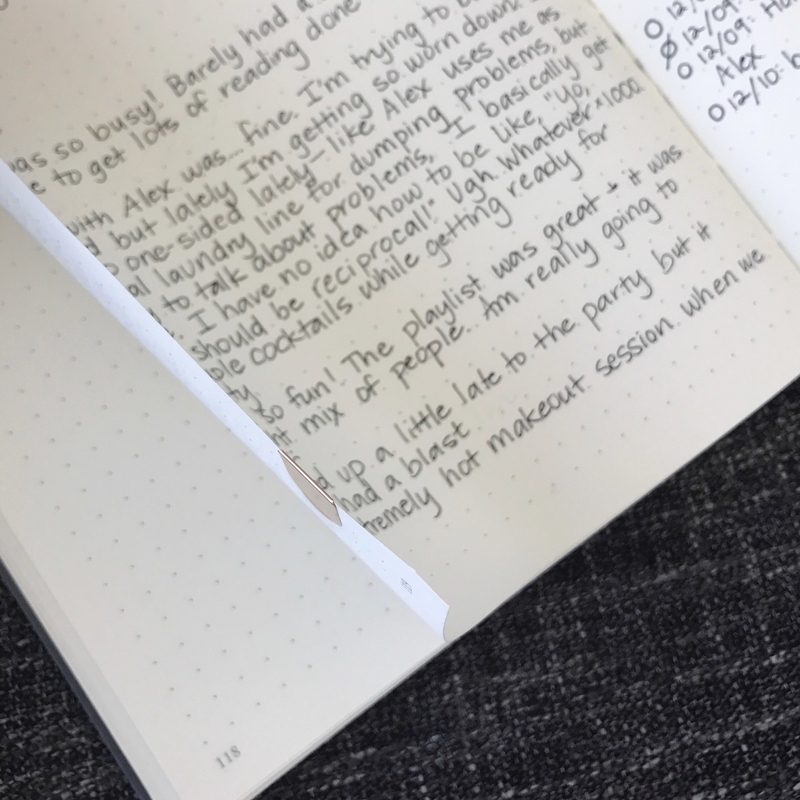 For a while, I was just using multiple bookmarks, but this was pretty inefficient — they slipped around in my journal, disappeared below the top edge of the book, and would sometimes fall out entirely. Paper clips (and bookmarks that use a paper clip-esque design) were another option, but they turned out to be way too bulky, and they damaged the pages. So I tried using sticky notes, but the edges quickly got crushed in my bag. And while I love these brass tabs, they definitely tear up the pages a bit, so they really aren't ideal for marking a daily page. Then one day I went down a stationery rabbit hole (as is my wont) and discovered book darts, which turned out to be the perfect solution. • They are super, super thin, so you can mark a bunch of pages without bulking up your book. 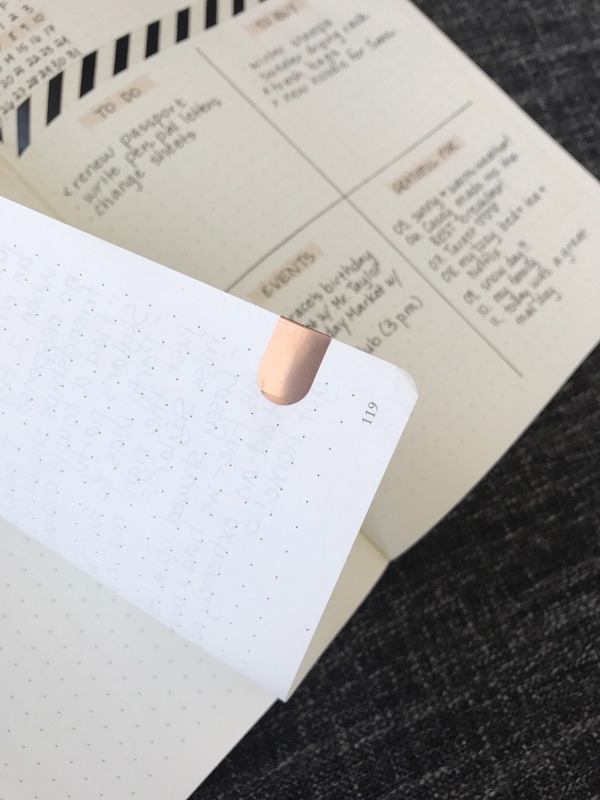 • They slide easily onto the page (it's seriously so satisfying to put them on) but stay firmly in place. • When you move or remove them, they leave no evidence that they were ever there. • They make it possible to mark an exact line, so they can replace sticky notes or highlighters. • They are cheap! They cost about 18 cents each — so you can use them liberally throughout notebooks, schoolbooks, and books you're reading for fun. • They are very pretty! Get them on Amazon for $9.20 for a pack of 50, or $12.94 for a pack of 125.